< Return to Rebates This program enables residents to install a residential Level 2 Electric Vehicle Charging Station, providing immediate emission reductions and encouraging clean energy vehicle deployment in the Regional District. To qualify for the $250 EV Charging Station rebate, residents must purchase and install an eligible Level 2 residential EV charging station. A list of eligible EV charging stations can be found here. Purchases of eligible products or services must be made after Program start date of December 1, 2011. Residents must have purchased an eligible Level 2 EV Charging station to qualify for this incentive. 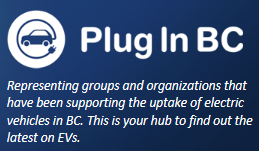 Please visit pluginbc website to learn about additional incentives for both the purchase of electric vehicles and the installation of electric vehicle charging stations are available through Plug In BC. A list of EV charging stations available to the public can be found here EV charging-station-map.